Lingering throughout Picard's life is a series of unsuccessful romantic relationships, stemming in part from his introspective nature as a career officer and his self-professed desire to avoid long-term commitments. Significant adult romances have included Jenice Manheim in 2342, Capt. Phillipe Louvois in 2356, rogue archeologist Vash in 2366-68, and Lt. Cmdr. Nella Darren in 2369. In addition, he also had barely acknowledged feelings for Ens. Marty Batanides following their Starfleet graduation; the Kriosian metamorph Kamala; and the widow of his best friend Lt. Cmdr. Jack Crusher, Beverly - a Starfleet doctor, longtime friend and his chief medical officer on the Enterprise. Aside from these feelings regarding children, family and women, Picard was even aloof with those he considered his close friends. Nevertheless, he has shown a willingness to stake his career for them - as when defending the inherent sentient's rights of first Data and then his daughter Lal against Starfleet confiscation, then acting as Worf's cha'dich before the Klingon High Council and stepping in on behalf of Crewman Simon Tarses during Adm. Satie's virtual witchhunt. Also, a Q-induced encounter in 2370 with a possible future timeline seems to have diffused this separation from friends somewhat. While he has had no more encounters with his best Academy mates, both of Picard's closest friends from his early career, Jack Crusher and Walker Keel, were killed in the line of duty. Part of Picard's private nature includes a difficulty in confronting deep personal issues, which then tend to become suppressed. Philosophically, he sees life and death as more than two choices of eternal or momentary existence; in fact, he believes there is another concept yet beyond human understanding. Genetic engineering with its pre-determination disturbs him, saying it robs humanity of the unknown factor that makes life worth living. Having to be patient in the presence of mounting problems, even if it is unavoidable or even the best path to take, is unsettling to him; nevertheless, he has shown a clear skill in knowing when to solicit opinions and when to act decisively. His Enterprise operations officer, Data, once estimated only a 17% chance that Picard would be so indecisive in a crisis as to call Starfleet for instructions. Though he often heatedly defends a strict interpretation of the Prime Directive, he has broken it numerous times when he felt it was warranted. For example, during his Enterprise career he allowed an Edo female to confront her "god" from space and brought a pre-spaceflight Mintakan leader aboard so as to undo the damage done by cultural contamination. (He later offered his life to a distressed Mintakan's arrow to prove he was no immortal himself.) He also chafes at the Starfleet directive banning captains from most away-team missions in uncertain or hostile situations. Picard had few friends as a youngster and self-admittedly "skipped his childhood," due to his early, single-minded drive to be in Starfleet. Though shy, he took piano lessons only to please his mother; he hated public performance and soon quit - a move he now regrets. He did build airships in bottles when young, and like his nephew years later he wrote a ribbon-winning report on starships; reading of the ancient Bajorans in the fifth grade might have been another influence on his lifelong passion for archeology. Later he was school president, valedictorian and a star athlete. Picard failed his first try on the Academy entrance exams but only required one more to pass. As a student athlete, he became the only freshman ever to win the Academy marathon - the event at Danula II marked the beginning of his friendship with Admiral Hanson - and he once out-wrestled a Ligonian in 14 seconds with a reverse body lift for a pin. He graduated at or near the top of his Academy class, even though he once failed an Academy class over a woman he refers to only as "A.F.," the initials he carved into gardener Boothby's prize campus elm tree; he was called at least once to the Academy superintendent's office, and he credits Boothby for helping him through an ordeal that saved his graduation. His lack of self-discipline as a young officer nearly led to his death in a near-fatal stabbing at Starbase Earhart in 2328 while awaiting post-graduation assignments. Picard went on as a lieutenant to meet Ambassador Sarek at the wedding of his son Spock. Another mentor of those years was archeology professor Richard Galen, whose fatherly approach was a trait sorely missed by the son estranged from his true father. In fact, it was not until after his abduction during the Borg crisis that Picard ventured home, the first time in 20 years, and began to heal the rift with his brother Robert, who had been jealous of his high-achieving younger brother whom he viewed as getting away with spurning family traditions and responsibilities. In an early highlight of his illustrious and fondly recalled years aboard the U.S.S. Stargazer, First Officer Picard took command of the bridge upon his captain's death and saved the ship, leading to his permanent promotion to captain. His command has abruptly halted in 2355 when the vessel was abandoned with relatively little loss of life during an encounter that, years later, was realized to be the first UFP-Ferengi contact; casualties would have been much higher had he not devised a deceptive warp-speed jump maneuver that today is still studied and bears his name. Even so, he endured a standard inquiry a year later but was cleared of all negligence. It was only a year before the Stargazer's loss, in 2354, that Jack Crusher was killed on an away team, and he had returned the body to his widow at Starbase 32. That same year he visited Chalna; earlier, the Stargazer had barely eluded ambush while on an unsuccessful truce mission during the Cardassian border wars. Picard assumed captaincy of the NCC-1701/D on SD 41124, having hand-picked much of his senior staff - such as two young officers who impressed him enough upon first meeting to win a place in the senior staff: Geordi LaForge once piloted his inspection tour shuttle and stayed up all night to refit an engine part he'd made a passing comment on, and he witnessed Tasha Yar risk her life to save colonists amid a Carnelian mine field. Finally, he had picked Riker from among simple resumes as his first officer and promoted him to commander sight unseen, impressed by his record of independence. His command presence and ethics persevered even through the Satarran memory wipe - despite orders, he would not fire on unarmed people. Within months of his Enterprise captaincy he was offered admiral's rank and the job of commandant of Starfleet Academy by Admiral Quinn but turned it down to retain his flagship. He also commanded the 23-ship blockade fleet to deter Romulan interference along the Klingon border during the empire's civil war of 2367-68, and undertook a covert raid in 2369 with two Enterprise officers on Celtris III to investigate a reported Cardassian metagenic weapons base, later found to be a hoax. Following the loss of the Enterprise at Veridian III, Picard won command of the ship's next namesake, one of the new Sovereign class, in 2172 on SD 49827.5. While Lt. Cmdr. Worf chose to be the exception, Picard's entire senior staff and many junior officers made the transfer with their captain. That continuity proves fortuitous: less than a year later, Picard was ordered away from repelling a second Borg attack for fear of giving unwitting aid to the enemy, but after reconsidering he led a deflection of the main assault. From there, a risky time-travel gambit paid off to correct temporal sabotage involving human first contact. Other mission performance highlights of his years on the Enterprises included his second meeting with Sarek, where at great personal risk he agreed to a mind-meld to save the Legaran conference in 2366 with the ailing ambassador; the legendary Vulcan had taken an interest in his career, calling it "satisfactory," but Picard was still awed by the UFP legend. They met again briefly as Sarek lay dying two years later as Picard was en route to another reunion with Spock, leading an underground pro-unification movement with Vulcan on Romulus. Picard has also participated in first-contact encounters with the Borg, Ferengi, Edo, Aldeans, Tamarians, Jarada, Malcoria III, Douwd, Mintaka III, Paxans, Cytherians, the Ux-Mal, and Devidians, among others, and served as a negotiator and diplomat on missions including Acamar III, Rutia IV, Angosia III, Bajor, Talarians, Turkana IV, Pentaurus V, Ventax II, Kaelon II, Lenaria, Gemaris V-Dachlyd, and Krios-Valt Minor. 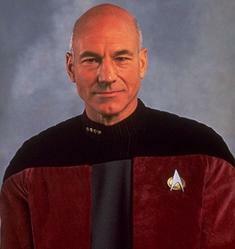 Picard keeps a healthy outlook on life with a wide variety of interests and recreational pursuits, including his near-professional pursuit of archeology, having studied the Iconian culture since his cadet days and addressed the Federation Archeological Council as keynote speaker on his oft-studied Tagus III ruins in 2367. He enjoys Terran literature in its written rather than holo-visual display, especially detective fiction such as Dixon Hill, and Shakespearean drama; oddly enough, while he enjoys role-playing the former in holo-programs, he avoids acting or any other performance art himself despite an interest in classical music and attending the shipboard concerts and plays on the Enterprise. Even so, he overcame his childhood dislike and began playing a Kataanan flute following his encounter with that culture. Picard's interests go well beyond archeology and literature, however. The subject of planetary motion and physics is another; he kept up with the Atlantis Project on Earth through journals; and is fascinated to be the first to discover the spacefaring life form, communicate with the Crystalline Entity, and reveal an ancient Promellian battle cruiser. He has studied semantics and keeps his Latin fresh, but has no interest in politics, dance, small animals, or the Enterprise senior staff's poker game until his 2370 encounter with Q and an alternate future timeline. This episode has also revealed a second and as-yet unexamined factor in the captain's command decision-making process to be considered in future crises: his command history itself. Certainly Picard has compiled an illustrious career and laudable accomplishments in both diplomacy and tactics, but the fact remains that he abandoned his first command -- a decision cleared by court-martial review -- and lost his second. While his quick accession to a new command betrayed any concern at Starfleet about his emotional fitness to lead a starship, it did play a factor in delaying his eventual decision surrounding the aborted abandonment and self-destruct of the new vessel to stop the Borg temporal invasion. In this case, thanks to the interference of a strong-willed contemporary associate of Zefram Cochrane, Picard was persuaded that self-destruct was his only option, then thankfully found other options that saved his vessel -- including his unusually strong bond with longtime second officer Data. Owing to a fatal stabbing through the heart in a brawl as a newly-graduated ensign in 2328, a cardiac device later found to be defective was implanted to save his life. The unit required replacement when it malfunctioned in 2365, overseen at Starbase 212 by then-CMO Dr. Katherine Pulaski. Four years later in a near-fatal Lenarian attack using compressed tetryon weaponry, it was damaged and replaced. He suffered head trauma to the right temple area in the same incident that led to Jack Crusher's death in 2355, and has sustained numerous injuries on occasion, none with long-lasting physical damage. He was formerly declared dead by Adm. Hanson as a casualty of war after his assimilation by the Borg; the ruling was rescinded six days later, after he fought through the imposed Borg mind of Locutus and got back to his own identity following his recapture. Along with his physical recovery, the invasive incident took an enormous emotional toll and required several weeks of counseling. Picard followed a similar though less lengthy recuperation following his capture and torture by Cardassians in 2369.